Does anyone have recommendations for eating out in Bermuda? Also, any insight on Bermudian specialties that ought not be missed? The Palms at the Surf Side Beach Club is very good. It's a place favored by the locals for their own get togethers. Try the rack of lamb, excellent! It sits on the south shore, in Warwick, just east of The Stoneham. The restaurant is situated around the pool that's on top of a coral cliff overlooking the Atlantic, very romantic! Have Fun! P.S. Almost forgot, all the seafod dishes you can get on the island are very good and true Bermudian specialties are variations of English dishes. So just try everything! Should you be one to enjoy a mixed drink, an island standby is 'A Dark and Stormy '. It's Bermudan rum and Bermudan ginger beer, great over ice. Burmudian Fish Chowder. Each place makes it slighly different, its like trying clam chowder in New England, everyone thinks theirs is the best. Made with Outerbridge's sherry peppers sauce, yum. 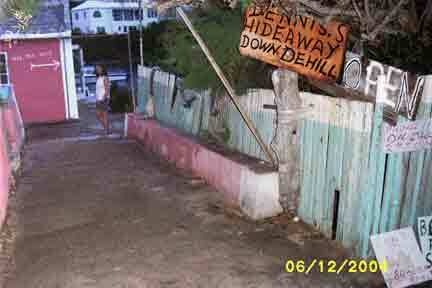 Best Bermudian meal I had there this summer - by a long shot - was at Dennis' Hideaway. To call it quirky would be a massive understatement, and it's not for everybody, but the fish chowder, conch chowder and shark hash were all amazingly good - much better than at more formal places. It's about as far off the beaten path as you can get in a place as small as Bermuda - it's at the end of the only road on the island of St. David's, east of the airport (almost everything else there is west of the airport). Although Chef Sea Egg would dispute calling it Bermudian food - he calls it St. David food and clearly considers the cuisine superior to that of the rest of Bermuda (although I doubt he'd refer it as "cuisine"). An understatement, have sent more than a few people here and most loved it, but a few almost took my head off when they returned. FWIW our family loved it. Bermuda is paradise, of course, but for those of us who can't relax in a place where men wear knee socks, Graham Lamb is a tonic. Walk up to Dennis's Hideaway, and Lamb, a round, unshaven man wearing a brown paper bag as a chef's hat, will welcome you with a grin. Better known as Sea Egg (Bermudian slang for sea urchin), Lamb has the only tasting menu we know of that is served on plastic plates. It starts with shark hash on toast, followed by conch fritters, curried mussel stew, and dark Bermudian fish chowder; then come the lobster, panfried shark, and deep-fried shrimp and scallops. "That's how we do it," Sea Egg says. "We're not going to change nothing." Fine with us. My fiance and I are going to be in Bermuda this coming May for our wedding. This thread hasn't been updated in a while, and I thought it might be worth waking it up again to see if anyone's got anything else to add. We'll be there a while -- 10 days -- so should have time to give a variety of places a shot. All thoughts/suggestions welcome and appreciated. (saved up LOTS of frequent flyer miles to manage that one!) We have dinner reservations there at The Newport Room and Waterlot where we also ate on our honeymoon all those years ago. I'd love to know other "local" type places to eat and the location of their grocery stores. Who needs expensive gifts- just send me dowm the aisle of a local market to get some interesting item I can't get in the states. Same place I stayed - the conciege floor was great - esp. breakfasts and early evening wine tastings. And it's a nice walk to the lighthouse (passing a great little pub on the way). Also, the ferry to Hamilton just across the road from the Southhampton is very convenient. For food to bring back, Outerbridges Sherry Sauce is a must. It's in almost all groceries there. 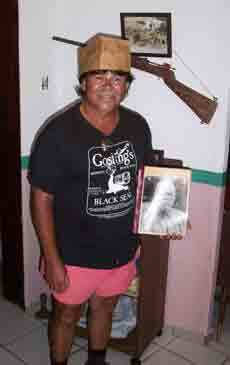 Gosling's Black Rum is another - again, easy to find. And if you look upthread, you'll see that I heartily recommend Dennis' Hideaway, although it's a bit of a trip from the hotel (we cabbed it there, which wasn't cheap, but it was better than using the moped during of the frequent - but short - thunderstorms they have there). The Swizzle Inn is a must. Near the airport, they serve an excellent rum swizzle (the restaurant's namesake, and Bermuda's 2nd drink, after the Dark & Stormy) and have very good fish chowder and fish & chips. It's been there since before 1950 and is priceless. Horton's rum cakes make very good (and tasty) gifts, though they're a bit on the expensive side. There are a couple of grocery stores on the south shore road (not far from Elbow Beach I think) and you can pick up things much cheaper than on Front Street or the hotel gift shop. There was a place called 'Fat Man's Cafe' that is likely similar to the 'Hideaway' above, that a cab driver said had the best food in Bermuda. We didn't get to it, and I don't know if it's still there, but several local we asked also raved about it. please report your experience after you get back. Of course -- is there anywhere else you'd recommend we check out? We're going to be staying at Horizons, if that helps. I cannot direct to you any restaurants, but Bermudian Cuisine is based mostly on fish. (No surprise there, huh?) Some dishes you may like to try are Fish Chowder as mentioned by many here, Codfish, potatoes, onions and bananas which is delicious for breakfast, and is made of dried or frozen salted codfish (and stinks like hell when being prepared.) Bean soups and Bermuda Onion soups, Cassava pie and Hoppin' John. My favorite fish to eat there is Wahoo. Although I've never had them there, I understand Indian curries are quite good in Bermuda as well. Also mentioned earlier in the thread, for evening cocktails you might try the Dark and Stormy, made of Black rum and Ginger beer. I love Bermuda, it's such a great place. I hope you enjoy your stay. Located on Track Side Lane in Devonshire, the menu includes fish cakes, burgers, and sandwiches. I also recommend renting the mopeds to take in the island, and of course a ferry ride or two. Is there any luck for a vegetarian in Bermuda, or am I doomed to a week of pasta and pizza? Going there over Memorial Day weekend. Of course there's plenty. Beans, Onions, and other root vegtables are the basis of many dishes. Also, Bermuda although quite British, is a tourist destination, and you'll have anything you want. i need some recs for a friend visitng bermuda, as far as restaurants (duh, of course), and also whatever other "action" bermuda has to offer. that goes for activities, and local culture and sights and anything else. good thing this thread has become active as of late. hoping for more ideas though! one additional thing that i won't bring up here because it's probably not right, but this guy is a cigar lover and is consider picking up and bringing back of few of those that probably aren't allowed. if anyone has *recent* experience with that feel free to PM me. thanks in advance for any food/sight seeing/activity ideas. There are great views of the island from the top of the Gibbs Hill Lighthouse, and there is a tearoom there for snacks. Swizzle Inn is a popular place for casual drinks and food. The Surf Side Beach Club has an outdoor restaurant on the pool patio with lovely views in the evening. The restaurant at the Reefs (Coconuts, I think), is good too. For beaches, Horseshoe Bay is the most popular beach, you can rent beach toys and get snacks there. It's where all the cruise people go, so it gets crowded. Church Bay has good snorkeling, and I think Warwick Long Bay is best for playing in the waves. Jobsons Cove is to the right of Warwick, there are always lots of fish in this shallow cove. If your friends are in a place where they can cook, Miles Market, located by the Hamilton Princess hotel, has a good selection of food, but it is expensive. We always got good wahoo there for grilling. i just moved here, I am in the industry and am interested in peoples opinion of the Island and the food scene. We have a great organic farmer here who raises chickens and lamb as well. Every one should check out what he has at the Farmers Market on Saturday mornings in the parking lot on Canal st. His name is Tom Wadson. My wife and I just got back from a cruise to Bermuda. We went to a couple of places that we thought were pretty good. In St George we ate at The Carriage House twice. It was pretty good food, the service was good and the wine list more than adequate. We also had lunch at Cafe Gio. This was a little more experimental than CH, but the food was still good. We also ate at a place in Hamilton twice. The Harborview Grill and Sushi bar was quite good. It had a fairly traditional menu that two of us ordered from and my wife had the sushi. The Kobe hamburger was quite good and the sushi my wife reports was exellent. We would return to any of these on our next trip. I can't tell you if there are better places, but I was happy with these. In comparison, the food on the Norwegian Majesty was mediocre at best and inedible at worst. To top it all off, the "freestyle" cruise has no benefits and is all drawback. You wind up waiting for a table at the two main dining rooms since everyone wants to eat at the same time. Since no one has assigned times, everyone arrives at once. If you have a large party, you can make arragements in advance - only at 5:30 and 9PM. Yes, you can make reservations at one of the other restaurants - if you do it quickly once on board. You still have to eat the bad food. My wife sent back the foie gras appetizer and said that the chef just didn't understand it. It was two ultrathin prices of foie cooked until it was tough. Glad you enjoyed your stay there, dans. The NY Times has done an article on Bermuda today, for those interested. After that we had fish, lamb, cheese and dessert courses. The sommelier Mohammed Mossad should have his own television show- he shared his knowledge of the wines he chose in a manner that was both informaitve and entertaining. An evening I will never forget! We've visited Bermuda every year since 1993 and love being there. For the first few years, there was a direct flight from here (RDU) to BDA....Bermudians loved this too; they came here on shopping sprees....but no more. Altho the flight arrangements are a little convoluted now, we still keep coming. I know there have been debates (not on eGullet) about bringing more nightlife/"activities"/gambling to BDA....we are NOT in favor of this. If someone needs this stuff, they should go elsewhere to vacation. We've met plenty of other visitors over the years who were quite happy to go to a relatively quiet, serene place such as Bermuda. Here's a suggestion for trip souvenirs to take home: take photos of the breath-taking views in BDA, have the pics enlarged, framed or whatever; otherwise, I'd suggest any of the various Outterbridge's sauces which are Bermuda-made. Why get run-of-the-mill souvenirs in BDA when you can pay less for the same stuff in USA? Finally, as to food: since we stay at a place (Cambridge Beaches, a cottage colony) where breakfast, afternoon tea, and a 5-course dinner are included, we don't eat out much at local establishments so I'm not in a position to offer lots of suggestions. As others have done, I can recommend the Swizzle Inn ("swagger in, stagger out" or something like that) near the airport end of the island and the Village Squire in Somerset Village. This is merely an observation, not a complaint: if you go to a "sit-down" place for lunch, plan to be there a while since Bermudians move at a relaxed pace and apparently assume that you, the vacationer, are in no hurry either. If you need a quick snack/lunch, go to a sandwich shop and pick up something at a counter. Such places are scattered here and there, sometimes in shopping areas, sometimes at roadside stands. We're set to go back in August....looking forward to it as always. My wife and I are thinking of going to Bermuda (sans kids) in the off-season (August). Our goal is to relax and sit on the beach and eat good food and drink good wine - no excessive exercise on this one. We have never been there before so we are looking for lodging and eating recs. We are looking for a place that we can relax - good service - not too noisy (e.g., not a lot of kids) etc. At the luxe end of the scale, The Elbow Beach Hotel in Paget Parish is very plush and on a gorgeous piece of sand. The same holds true for the Fairmont Southampton. Fairmont also have a property in Hamilton. Michael Douglas's family has restored Ariel. This last link will take you into Fodor's Bermuda, which mentions many other options at all budget levels. We looked in on Oxford House and The Salt Kettle, both of which offered trim and charming accomodation and are nearby Hamilton. But watch out for false economy. With no rental cars, staying any distance from the beach can mean hot delays while waiting for taxis, which are not cheap. A visit to the Royal Naval Dockyard is a worthy morning's excursion - try lunch at the Frog and Onion. Dining can be tricky on Bermuda - you also pay to get close to the ocean, especially in the evening, and experience quickly taught us that the value and fun was to be found in more casual venues, such as The Black Horse Tavern in St. George's - but dine outside. The Swizzle Inn and The Beach are quality drinking spots, if my notes can be trusted. A little more dressed up is The Seahorse Grill. In Hamilton, there are a number of ubiquitous Italian restaurants where you can, with complete confidence, wander from one to the next with the same menu in hand. In August, the humidity is fierce, so stay close to the water, book a hammock or hammock a book, or better yet, immerse yourself completely in the pea soup sea.